UPDATE: The Catholic Thing has posted an update, especially of interest is the last half of the report regarding Vigano and Oullette HERE. If you intend to follow the ill-advised Youth Synod in Rome, I suggest you check in periodically with “The Catholic Thing” which has Robert Royal there for the duration. The conflicts between bishops over this Synod involving the Pope is quite telling. Here is the introduction to the whole affair in today’s article by Robert Royal. 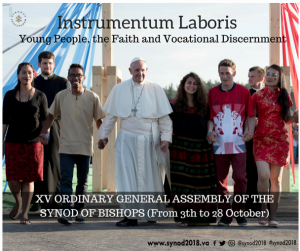 Note: I am in Rome for the Synod on “Young People, Faith, and Vocational Discernment,” which begins today. I’ll be here, Deo Volente, essentially the whole month of October. It’s an inopportune time for such an event: the abuse crisis – and the involvement in that crisis of several bishops participating in the synod – have damaged the Church’s credibility with young people. The “Working Document” (Instrumentum Laboris) is cumbersome and deeply flawed – more sociology than theology – as our friends Archbishop Chaput and George Weigel have argued. And the Instrumentum betrays signs of wanting to move the Church more in the direction of secular culture rather than moving the culture in the direction of the Church. But the show goes on. The Catholic Thing will be bringing you regular synod reports (daily, if warranted) from Rome, as well as our regular columns during October. This is a crucial moment: Oremus pro invicem. – Robert Royal. I would suggest you subscribe for free to this excellent daily review of everything Catholic, intelligent and worthy. It also exposes things that need to be exposed, and extols that which is of beauty and virtue and righteous. Visit The Catholic Thing to sign up. This whole synod makes me shudder. But, I think the worst is what will come after it when a final document is prepared and approved by Pope Francis. God help us! Pray everyone, please pray.